A good audio interface is a must-have for anyone who is into the highest quality listening or someone looking for quality recording experience. You might not be acquainted with the term audio interface, hence looking for the best audio interface for yourself could be a big challenge. Fret not. We are here to provide you with a comprehensive guide to buying the right audio interface for yourself. Now that you know of the key factors to buying an audio interface, here is a list of the top 10 audio interfaces that are the most popular as well as useful ones in the market as of now. 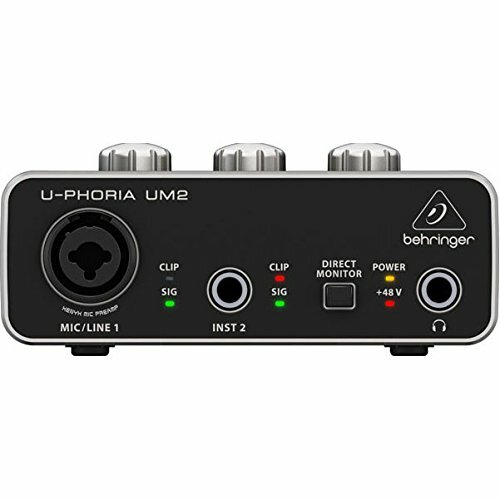 The U-Phoria UM2 is a compact and affordable dedicated audio interface. It offers 2 inputs, one is a single XLR input to plug in your microphone; while the other is a1/4” cable that will blink red if you are clipping. On the backside is a switch that allows you to toggle the power on/off. It also provides two outputs as well. The first one is a ¼” headphone output jack on the front side and the other is an RCA output at the back to connect to studio monitors or an amplifier. Moreover, it supports a 16-bit resolution at 48 kHz sample rates, which is sufficiently loud and clear for professional sound quality. The mic preamp is also clean and clear. DAW compatibility: Ableton Live, Avid Pro Tools, Steinberg Cubase etc. OS compatibility: Mac OS and Windows. Inputs: Microphone, Guitar/ live instrument, headphone input. 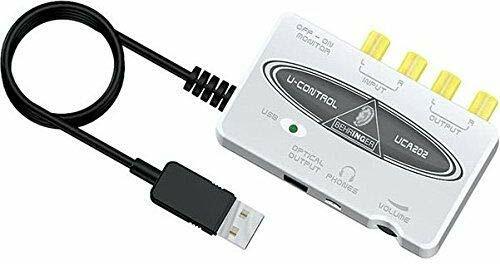 The ultra-compact and bus-powered U-Control UCA202 audio interface can easily be connected to your Windows and Mac computer with any audio device. This does not require any setup. All you need to do is simply plug your USB audio interface into an available USB port on your computer. It consists of two analog inputs and outputs. The stereo headphone output with control levels allows you to monitor both the input and output. The U-Control download offers a wide range of software packages for recording and audio editing. DAW compatibility: Compatible almost all DAWs. This is an ideal choice for singers and songwriters who want to record professional high-quality vocals and guitar. It is affordable and easily portable. All you need to do is plug in your mic and record high-quality sound in studio-quality audio. On the backside of the device is the TRS/XLR inputs and MIDI connections, along with a digital clock and optical connections. If you want to use is for personal monitoring, there is a ¼” headphone output and control. Power is provided via the USB connection, which means you do not need an external power supply. The preamps and audio quality are pretty impressive as well. DAW compatibility: Compatible with most DAWs including, Ableton Live Lite, First Focusrite Creative Pack, and Tone Bundle. Sample sound rates: 44.1 kHz, 48 kHz, 88.2 kHz, 96 kHz, 176.4 kHz, 192 kHz. It is an excellent solution if you are looking for high-quality sound recordings. It is a USB bus-powered audio interface with 2 microphone inputs and 2 balanced TRS outputs and MIDI input/output so that you can carry it with you. It also comes with Studio One Artist music creation and production software that gives you unlimited tracks so you can start recording right away. It uses professional grade analog as well as digital converters with a range of 102db and 24-bit sample rate, making it one of the best USB powered audio interface in the market as of now. DAW compatibility: Compatible with most DAWs. Outputs: 2 balanced TRS output. Sound: 441.1 and 48 kHz rate. 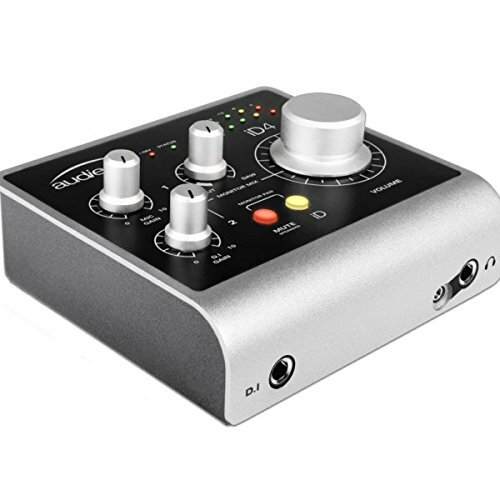 The iD4 is a compact and easy to use USB computer audio interface. It consists of 2 separate inputs, one is a mic input with a combination of XLR jack and switchable 48V phantom power, along with a J-FET based instrument DI input. It also consists of a headphone output on TRS jack and a pair of loudspeaker outputs. Apart from this, there is a Monitor Mix front-panel knob that handles the input signals with the DAW return. There are also twin five-LED curved ladder meters. The most useful feature on the ID4 is the button that is labeled “iD” which helps in ScrollControl function to turn the volume control into a rotary encoder in order to control the plug-in parameters. OS compatibility: Mac OS, Windows, and iOS. The Steinberg UR44 is a compact and rugged audio interface with 6 input channels and 4-output support, along with MIDI in/out and 2 independent outs for headphone. There are 4 classic amps (clean, crunch, lead, drive) are pretty good sound-wise. The front end consists of plenty of mic gain (+52dB max). One of the most important features of this audio interface is the onboard DSP, which can be used to run the bundles dspMixFx application, power plug-ins within the applications including 4 guitar amp situations. It is solid in design and ruggedly built with an all-metal design. The 4 inputs in the front have D-PRE mic inputs which also accepts ¼” balanced and unbalanced connectors. DAW compatibility: Compatible with most DAWs, Cubase is recommended though. Inputs: 2 line inputs, 4 mic XLR preamps. Outputs: 4 output channels, MIDI I/O ports. The Focusrite 18i20 is a second generation Scarlett audio interface with 8 natural-sounding Scarlett mic preamps along with plenty of headroom and low and minimal distortion. It has an upgrade from its older version with additional two newly designed instrument inputs and increased headroom. The sound quality is pretty impressive with sample rates up to 192 kHz and 32-sample buffer. It also comprises of 10-balanced ¼ inch jack outputs with the dedicated stereo pair, along with 2 headphone outputs with dedicated gain controls and a MIDI I/O. Its monthly software plug-in offers Focusrite’s Plug-in collective via download upon registration. It is compatible with iPad, iPhone as well as iPod touch. This audio interface also offers 2-years limited warranty on any manufacturing defects. DAW compatibility: Mostly all DAWs. Inputs: 2 newly designed instrument inputs. Outputs: 10-balanced analog outputs including the dedicated stereo pair. The UltraLite AVB is a USB 2.0 audio interface with 2 preamps each of which offers 60dB of gain and 2 Hi Z guitar inputs, 6 analog inputs, 6 analog outputs along with separate phone and monitor outputs. It also consists of 8 channel ADAT mic preamp and an external headphone amp all of it with ease of use. The LCD front panel controls give access to most of the features of this audio interface. The front panel controls consist of 5 rotary knobs that provide level control for mic and DI inputs along with a shared output level control for the main outputs or even the headphones. DAW compatibility: All major DAWs. OS compatibility: Mac OS, iOS, and Windows. Inputs: Analog I/O; 2 mic inputs, 2 guitar inputs, 6 line inputs. See if the company you are planning to get the audio interface from also sells DAW or not. At times seller could also provide a package deal of audio interface with DAW, see if you could crack a deal like that. However, it should not be a cause of worry for you since most of the high-quality audio interfaces are compatible with some of the famous brands of DAWs like Logic, or Ableton. Once you have understood about your device’s compatibility with the DAW, check for the interface’s compatibility with your Operating System. These days, all devices are compatible with both Mac OS as well as Windows; however, there are some that support only one OS. So check that before you plan to buy one. Aforementioned, your audio interface will work as the catalyst to connect your computer to the speakers. Hence, many times, the cable type of the audio interface might connect to your computer, but sometimes it might not. 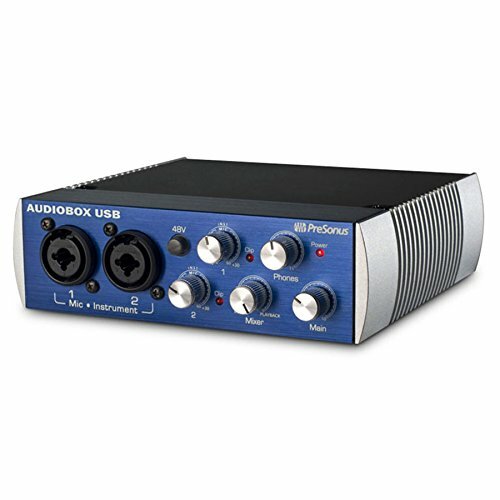 USB Port – USB audio interface connection is the most widely used connectivity for home studios as well as for bedrooms. It comes at an affordable price. All computers have a USB port. Firewire – Firewire is not quite a common option for most audio interfaces as it mostly comes with the high-end models. However, it allows for a faster data transfer. Thunderbolt – This is one of the freshest connectivity ports with audio interfaces but is gaining high popularity. It is compatible with both MAC as well as Windows. For connecting to any audio interfaces, one needs to understand what type of interface is required. And for this, you need to specifically understand the input and output channels to connect your interface for good sound recording. For instance, you cannot connect your piano with a TRS microphone input. Hence it is important for you to understand which channel your audio interface. Microphone Input: Allows you to connect your audio interface directly into a microphone. Line Input: Mostly used for microphones or instruments such as the guitar. MIDI Input: Used for MIDI-based keyboards and keyboard controllers. DI Input: Used for live instruments such as guitars or bass. RCA: A popular channel with a most audio interface, recognized by its white and red cables. TRS: Left and right cables so as to allow connection to speakers to separate it. MIDI: Used for MIDI-based keyboards and keyboard controllers. XLR: Used typically for mixers. If you’re a beginner, a simple interface with the microphone, DI and MIDI inputs are your basic necessities. For outputs, all you need basically is an RCA output that can connect to a studio monitor. There are two common shapes of most audio interfaces. Desktop – They are compact in size and easily portable. Rack Mounted – They are slightly heavier and longer and require a rack-mounting desk. Desktop size is mostly for beginners and for the home setup, while rack-mounting size is for the professional studio setup. Aforementioned, having a good audio interface is beneficial for high-quality sound recording and production. With an in-depth understanding of its key features and factors, buying the best audio interface for yourself in the market is going to be a cakewalk for you. In this article, we have given you a complete guide to understanding everything you need to know before making the purchase. Looking for the best audio interface? Find one that fits your budget and needs with our detailed audio interface reviews and comparison charts.